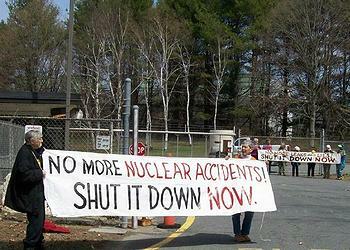 WASHINGTON, DC, August 27, 2013 (ENS) – Entergy Corporation today said it plans to close and decommission its Vermont Yankee Nuclear Power Station in Vernon, Vermont. The station is expected to cease power production after its current fuel cycle and move to safe shutdown in the fourth quarter of 2014. Anti-nuclear activists greeted the news with delight. After years of protests, conferences and lawsuits, the nuclear plant that has worried them will be shuttered. Vermont Yankee, a 605-megawatt single unit boiling water reactor, began commercial operation in 1972. 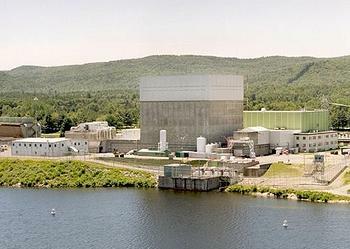 Entergy acquired the plant from Vermont Yankee Nuclear Power Corporation in 2002. In March 2011, the Nuclear Regulatory Commission renewed the station’s operating license for an additional 20 years, until 2032. The station will remain under the oversight of the Nuclear Regulatory Commission throughout the decommissioning process. “We are committed to the safe and reliable operation of Vermont Yankee until shutdown, followed by a safe, orderly and environmentally responsible decommissioning process,” said Leo Denault, Entergy’s chairman and chief executive officer. The decision to close Vermont Yankee was based on financial factors, including “a natural gas market that has undergone a transformational shift in supply due to the impacts of shale gas, resulting in sustained low natural gas prices and wholesale energy prices,” Entergy said in a statement announcing its decision. “Wholesale market design flaws that continue to result in artificially low energy and capacity prices in the region, and do not provide adequate compensation to merchant nuclear plants for the fuel diversity benefits they provide,” was also a determining factor in Entergy’s decision, the company said. Making the decision now and operating through the fourth quarter of 2014 allows time to duly and properly plan for a safe and orderly shutdown and prepare filings with the NRC regarding shutdown and decommissioning, said Denault. Once the plant is shut down, workers will de-fuel the reactor and place the plant into SAFSTOR, a process whereby a nuclear facility is placed and maintained in a condition that allows it to be safely secured, monitored and stored. Entergy operates 10 other nuclear reactors with a total installed capacity of more than 10,000 megawatts in Arkansas, Louisiana, Massachusetts, Michigan, Mississippi and New York. Still, the Vermont Yankee closure is part of a wave of nuclear plant closures and decisions not to build. On August 1 Duke Energy announced that it is abandoning its planned Levy reactor project in Florida. Duke said it will cancel an engineering-and-construction contract for the two-plant complex in Levy County, about 90 miles northwest of Orlando, because of licensing delays by the Nuclear Regulatory Commission and the backing of state legislators for a law that allows the utility to recover its construction costs long before the plants are operating. In May, Duke Energy notified the Nuclear Regulatory Commission of plans to suspend its 2008 application for two proposed new nuclear units on its Harris site in Wake County, North Carolina, although the site has not been eliminated from long-term consideration as a site to expand Duke’s nuclear fleet. The Duke decision to leave the Levy project on the drawing board came one day before the announcement that the French-subsidized nuclear giant EDF is pulling out of the U.S. nuclear power market due to the inability of nuclear power to compete with alternatives and the reduction in demand growth caused by increasing efficiency of electricity consuming devices. In recent months, four other nuclear reactors have been shuttered: San Onofre’s two reactors in California, the Kewaunee reactor in Wisconsin, and Crystal River in Florida. The nuclear industry also has killed at least five large planned “uprate” expansion projects – Prairie Island in Minnesota, LaSalle’s two reactors in Illinois, and Limerick’s two reactors in Pennsylvania. In March, NRC commissioners upheld last summer’s licensing board denial of a construction and operating license for the proposed Calvert Cliffs-3 nuclear reactor in Maryland. The decision marks the first time in history that the NRC has upheld the denial of a license for a commercial nuclear reactor.